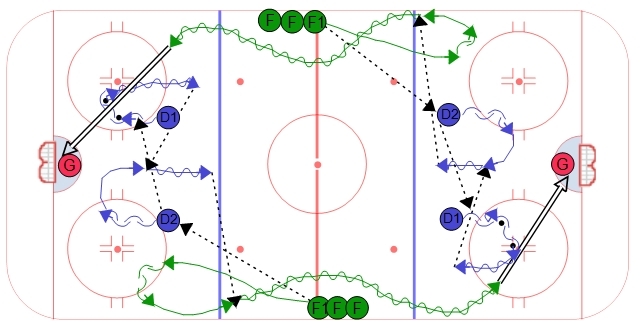 This can be a great high tempo flow drill hockey drill. A good one to add to your team practices once a week and maybe the practice before you play a game where you may be planning more flow drill. The drill depends on a quick hinge play by the defense. The forward who starts the drill has to provide support with good timing in their neutral zone transition. The key for the defense is to move the puck to the outside with the first pass and then back to the middle of the ice on the second pass. It is important the defense focus on receiving the second pass in the middle of the ice where they will pass the puck to the forward. The pass to the forward should not be a verticle pass if the forward's timing is good. After receiving the pass, the forwards attack the blue line and get a long shot on net.